Guaranteed entry before 5pm . "Celebrating it's 20th anniversary in 2016, Drumcode's full-hearted philosophy of releasing music always with the DJ in mind has allowed the label to expand into an all-encompassing brand, one now heralded as much as musical identity as it is an attitude among the underground community - Residents Advisor"
It gives us great pleasure to welcome in our 8th year of Shangri-La with no other than Drumocode. Adam Beyers well nurtured label has brought through some of the great techno DJ's of today. 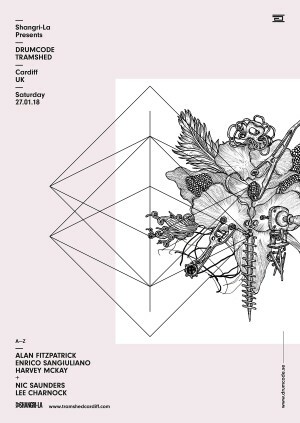 We are joined on the 27th by Alan Fitzpatrick, Enrico Sangiuliano & Harvey McKay. First release on sale THIS Sunday 8pm! ► This is a ticket ONLY event! To ensure tickets are delivered safely and securely and to keep the price as low as possible for you, the ticket buyer, Shangri-La generally uses our E-ticket system unless otherwise stated. When you purchase tickets through Shangri-La, the full face value of the ticket is shown. This price is the price set by the event promoter and we pay this full amount to the promoter without any deductions.